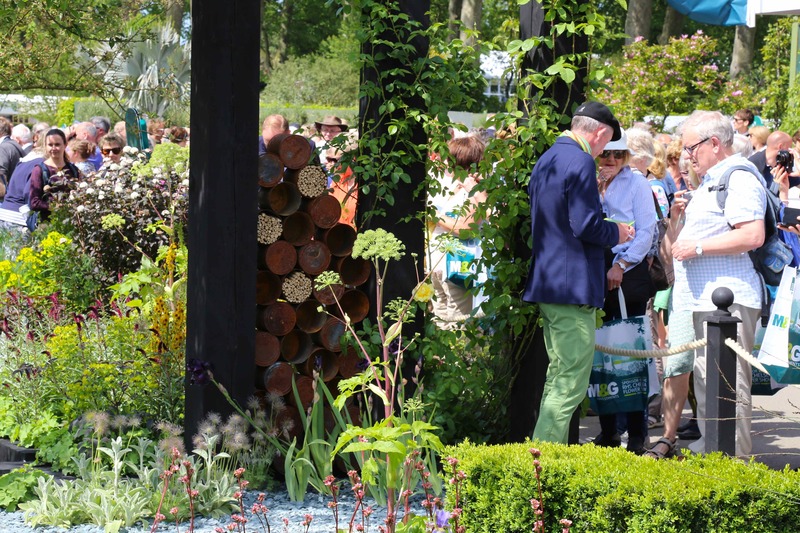 We visited Chelsea this year on a jam packed sunny Thursday. The earlier wind and rain of the first three days gave way to sunshine and by the time we arrived at 11a.m its fair to say the place was heaving. We made our way through some jolly trade stands, buying a few rusted plant supports en-route to the 8 Artisan Gardens. Finding little room just to stand and take any garden in or even walk from a to b we did a u-turn, had a cup of tea and listened to the band. Fortified we headed to the bottom of main avenue, to view some of the 15 large show gardens. 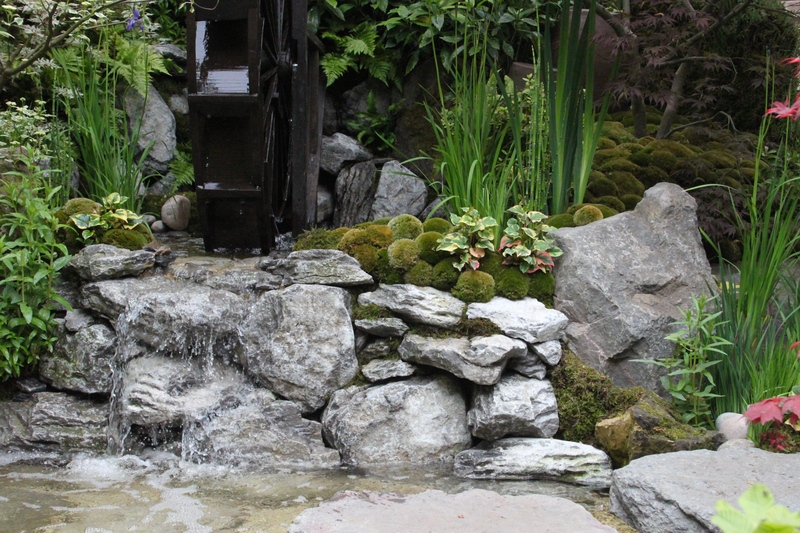 Dan Pearson’s Chatsworth Garden was built on the Triangle, slightly away from other gardens and overlooked by the lofty media platform where Monty Don and Joe Swift delivered the nightly show. Pearson designed his brilliant, brilliant garden for folk to walk all the way around, there were no ropes except for a metre wide strip at the path entrance and exit, which traversed his garden, originally it was planned for all visitors to walk through the garden and view from the inside, health and safety put a stop to that and just a few selected guests were allowed on. There was even a bench for visitors to sit on. How inclusive! From the triangle we headed up main avenue first stopping at Sean Murray’s garden, the winner of ‘The Great Chelsea Garden Challenge’ TV programme. 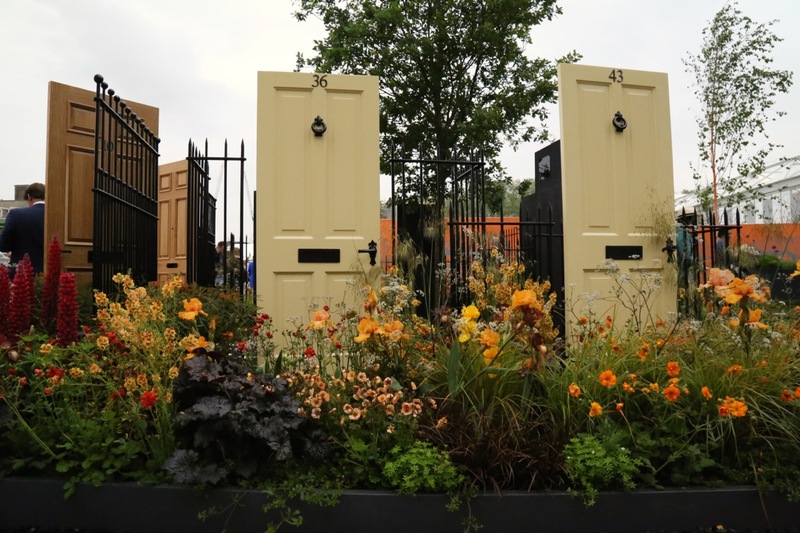 To highlight the RHS campaign to green our tarmaced and concreted over front gardens, Sean’s prize for winning the TV show was the opportunity to design the ‘Greening Grey Britain’ Chelsea garden. 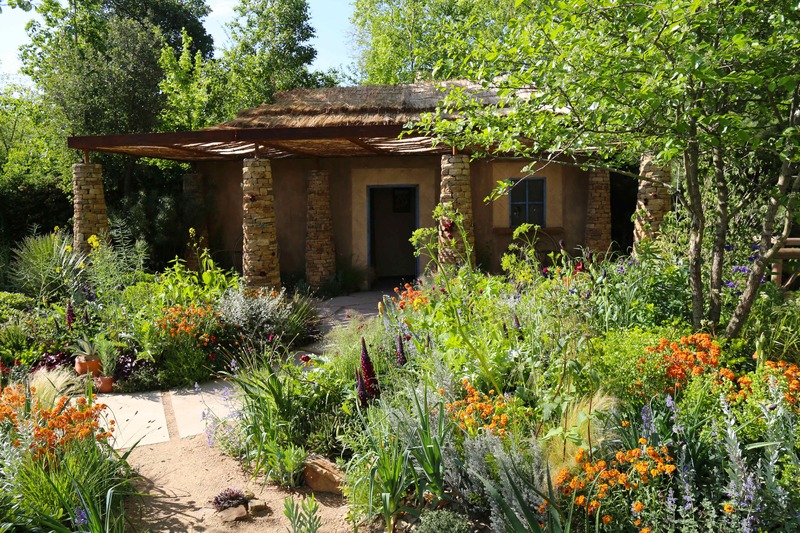 Of the 15 main gardens, we loved Prince Harry’s Hope In Vulnerability garden and it was voted the People’s Choice show garden. 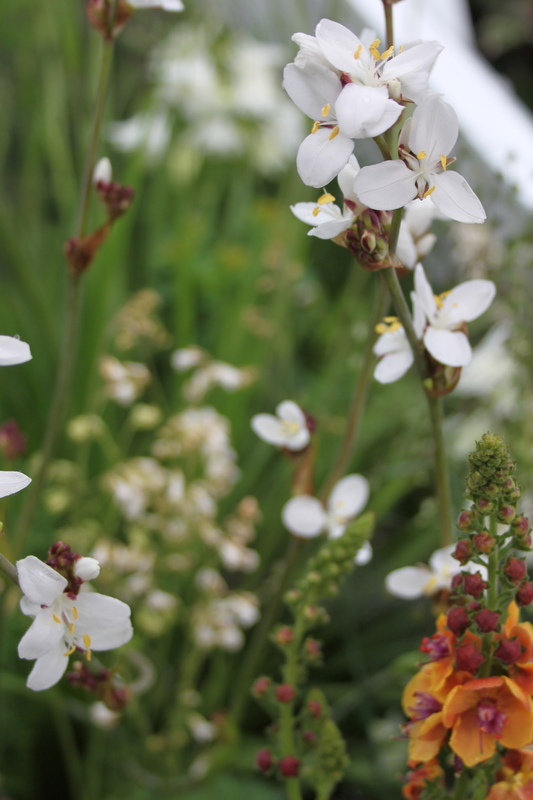 The garden was designed to raise awareness for Sentebale’s mission to tackle the stigma of HIV in adolescents, helping to provide access to care and education and providing psychosocial support. This was a garden that looked as if people lived there. The planting style this year was wild even on the more formal gardens. 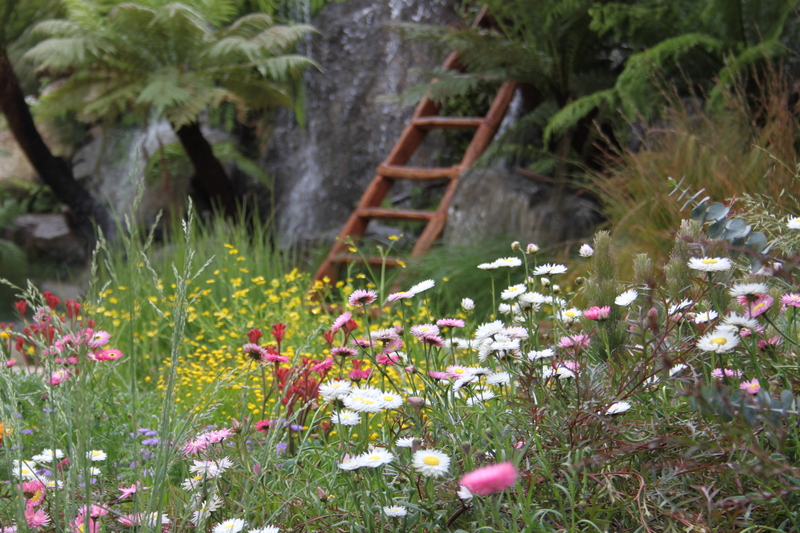 I prefer wild at home but Chris Beardshaw’s style of planting on his ‘Healthy Cities Garden’ was truly beautiful. A wonderful selection of texture, form and colours. After the show the Garden is being entirely relocated to Poplar in East London as a part of a community project. The Healthy Cities programme focuses on giving children a healthy start through a variety of initiatives. 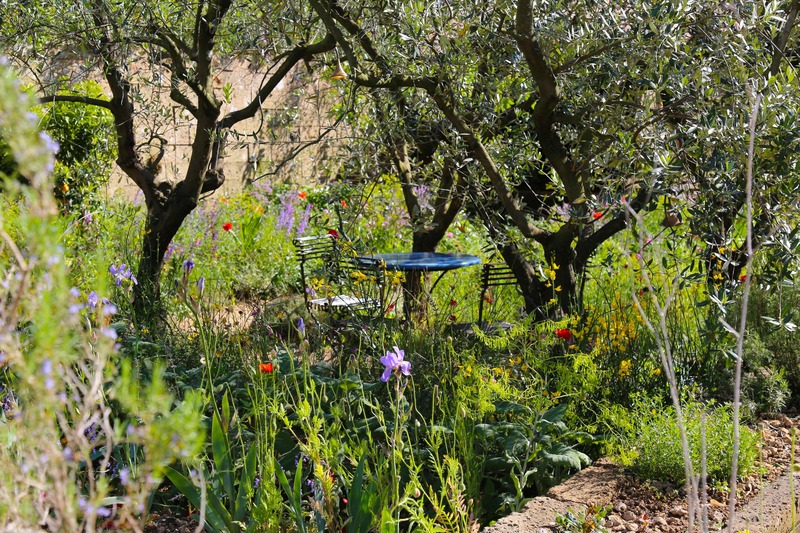 And the garden loved most by Monty Don. 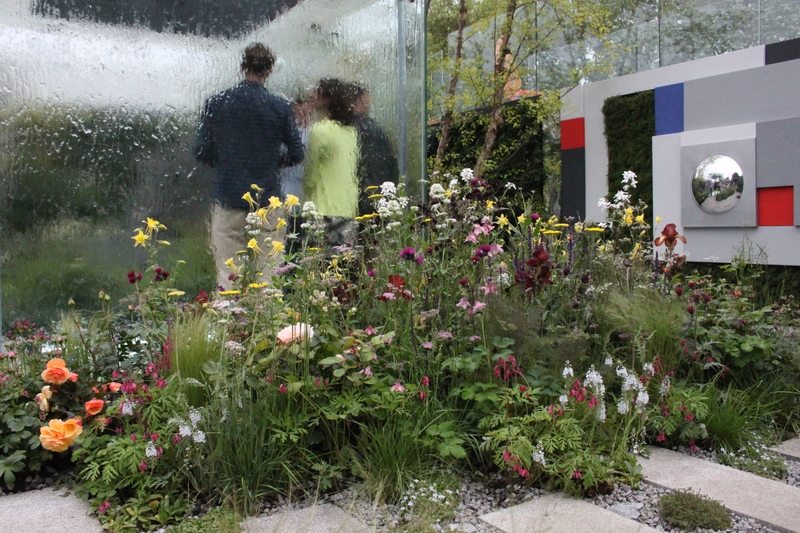 The Perfumer’s Garden was a short step away from the 9 Fresh gardens, rapidly becoming my favourite part of the show. Unlike the Artisan category, which is squeezed into an oppressive tunnel. (My suggestion if anyone with any clout reads this, is at the very least a one way system for the Artisan category or put all the swanky greenhouse trade stands down there). The Fresh Gardens like the Chatsworth garden can all be walked around. Our favourite the World Vision Garden. This is another garden designed to raise awareness. World Vision is the worlds largest international children’s charity and the garden was inspired by Cambodian rice fields. The dark reflective water representing the fear of hunger that vulnerable children in Cambodia live with. 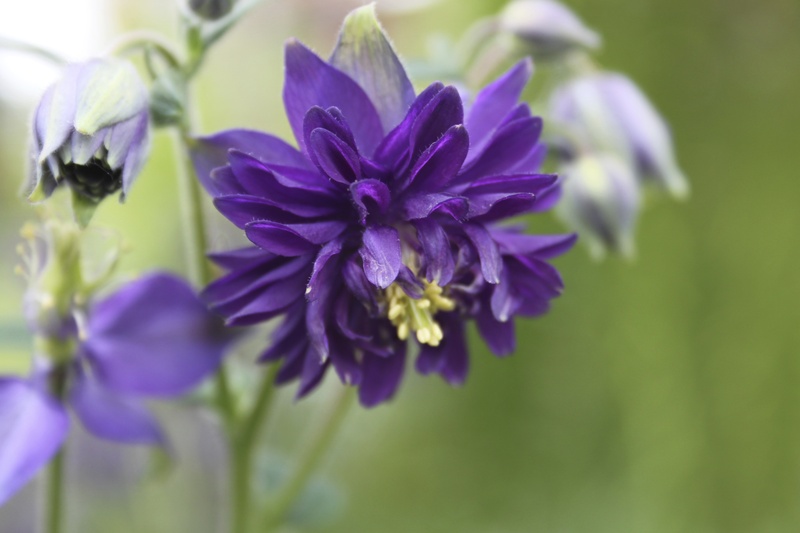 Hope was symbolised by delicate violets. World Vision are asking folk to be involved and on Friday July 10th wear something floral as a fundraiser. We dipped in and out of the the Floral Marquee now named the Great Pavilion, its a whopping 12,000m, which according to the Telegraph is the same size as two football pitches and enough room to park 500 London buses. There are around 100 exhibits and the smell is wonderful. 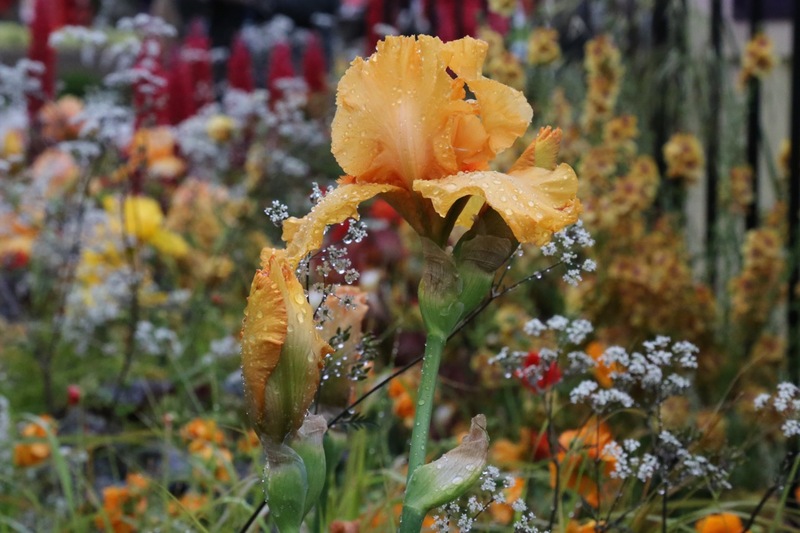 We had watched the interview on TV before coming with the young couple in their 20’s Laura Crowe and Jack Willgoss at their first Chelsea and exhibiting perennial Violas. Having met when they were training in Horticulture at RHS Wisley they are now fulfilling their dream and run Wildegoose Nursery They won a silver-gilt, not bad for their first time! We then made our way back to the Artisan gardens for the third time, the second time the one garden causing the major traffic jam was still surrounded by people. But at 7.45p.m just before the show was closing I finally managed to see the Japanese Garden. This year Kazuyuki Ishihara was awarded his 7th Chelsea Gold Medal. Piped to the post for People’s choice Artisan garden was the Breast Cancer Haven Garden, my photograph does not do it justice. So I am showing you another garden in The Artisan category instead. Of course we would go again, I love the razzmatazz of the show gardens and especially enjoy seeing the wonderful plants inside the Great Pavillion, but the crowds are something else. In 2004 Chelsea was extended from 4 days to 5, maybe just one extra day to spread the crowds out would be good. 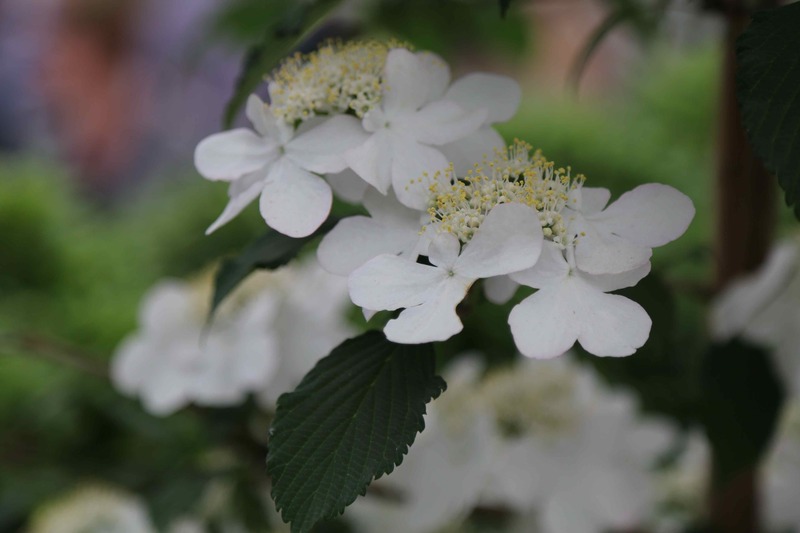 RHS Plant of the Year 2014 Hydrangea macrophylla Miss Saori Hillier Nurseries. 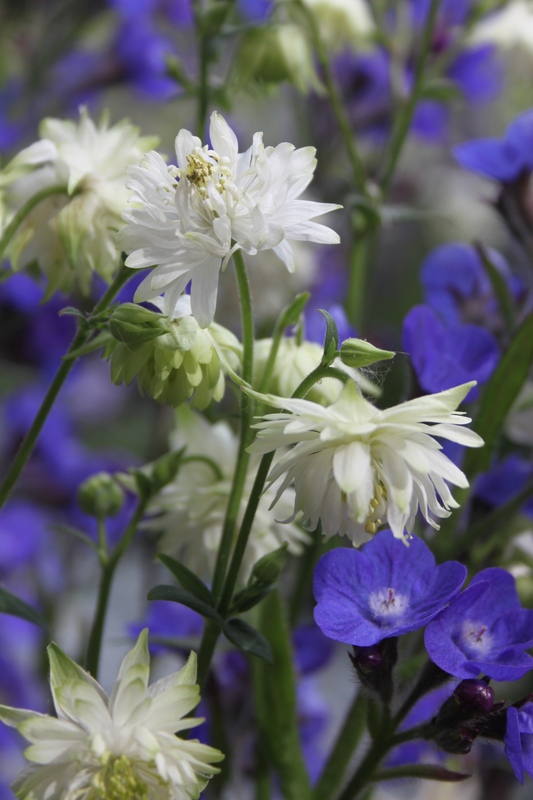 Chosen by a panel of RHS judges from 20 shortlisted new plants. We visited Chelsea last wednesday, having dithered over the ticket order we were only able to purchase an afternoon ticket. Its worth buying the kings ransom all day ticket though as there is so much to see and negotiating crowds takes time. The Fresh gardens, were better presented this year, still located on the far side but in their own area, rather than stuffed in amongst trade stands. 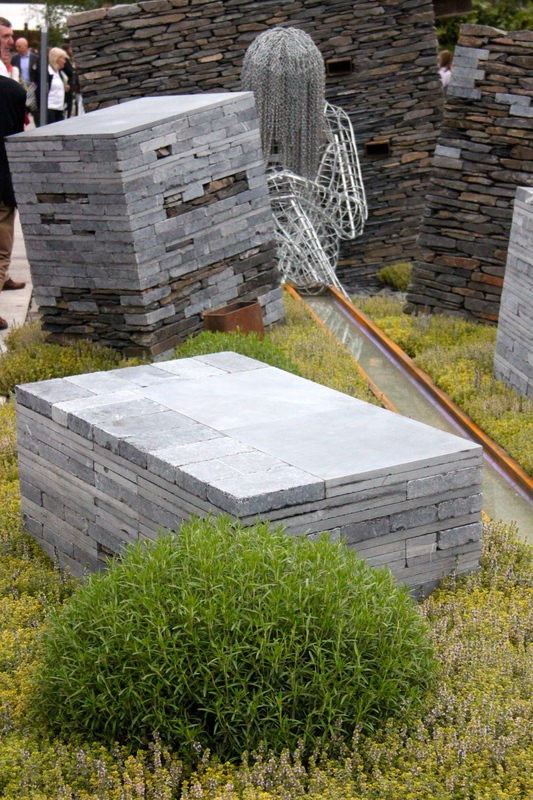 The 10 very individual Fresh gardens were the gems of the show. 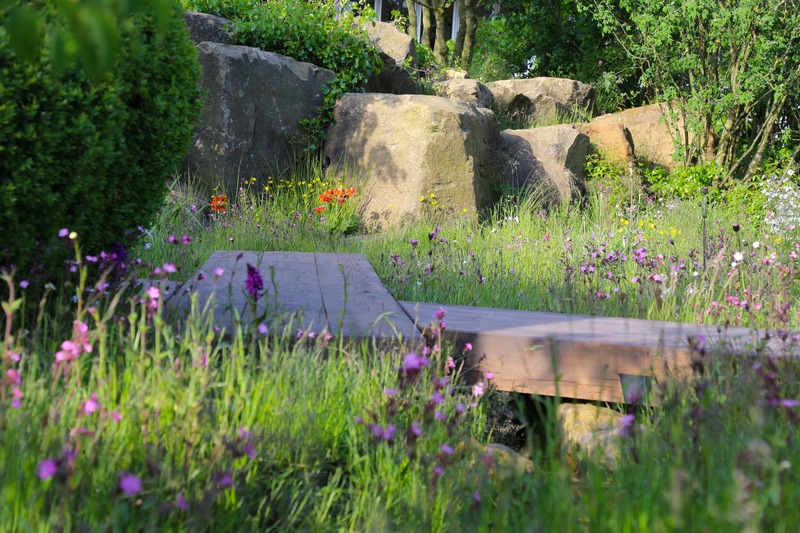 RHS blurb…”we are challenging designers to be brave and step outside the perceived Chelsea garden”. I wear glasses and have done since a child, my sight is my most important sense, each year the prescription is strengthened and now varifocals. The RNIB Minds Eye Garden was a sensory experience, designed to stimulate ones imagination or minds eye, the point being that non sighted or partially sighted could enjoy this garden too. Centred around a glass box with water running down the sides, standing inside the box, the view for a fully sighted person was blurred. The fabulous planting became a muddle. Enclosed in the stands goodie bag a glasses shaped cloudy dark spotted piece of plastic, looking through gave an idea of what it would be like to have diabetes affected sight. 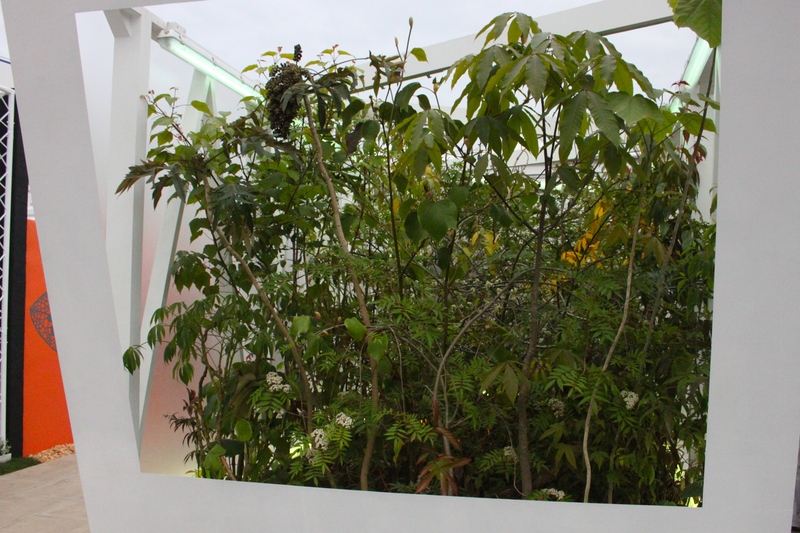 Look closely and the planting is contained within a large industrial container with only one viewing point and bench to sit and look. 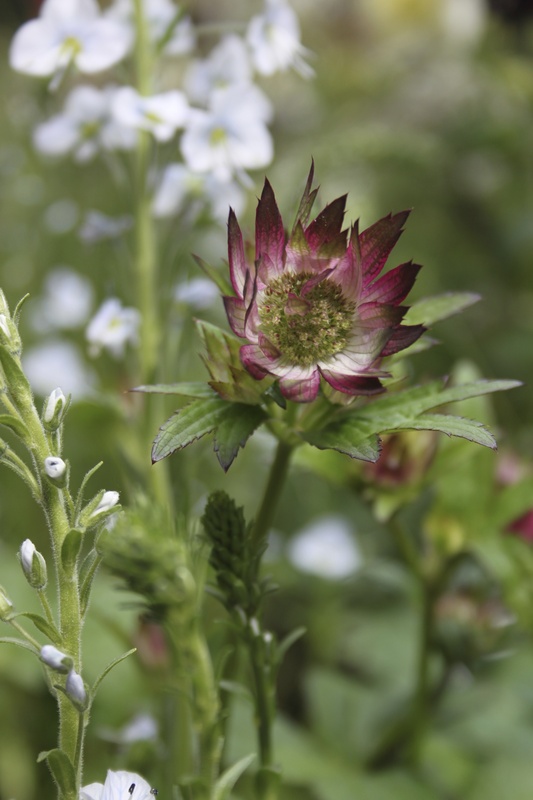 The plants were all collected by modern day plant hunters Sue and Bleddyn Wynn-Jones of Crug Farm Plants. 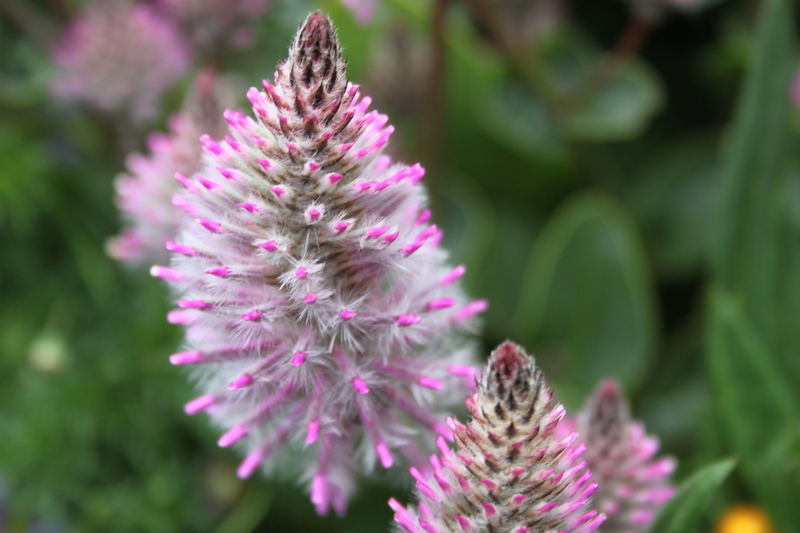 The plants are all wild origin and used in their natural uncultivated form. The blurb says this raises ideas of exploration, discovery and imagination and yes it filled the brief – Brilliant. 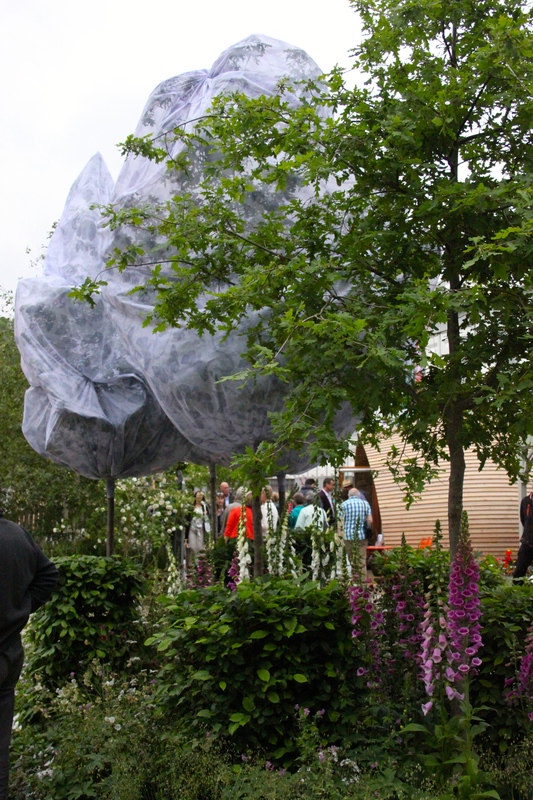 A garden with an important biosecurity message, the oak trees at one end of the garden were wrapped in fabric to symbolise the the impact of this devastating moth. Its native to mainland Europe and was imported accidentally into the UK in 2006, caterpillars strip the tree bare leaving the Oak vulnerable to other pests and diseases and less able to withstand extreme weather. Why are we still importing Oak trees, any trees for that matter. 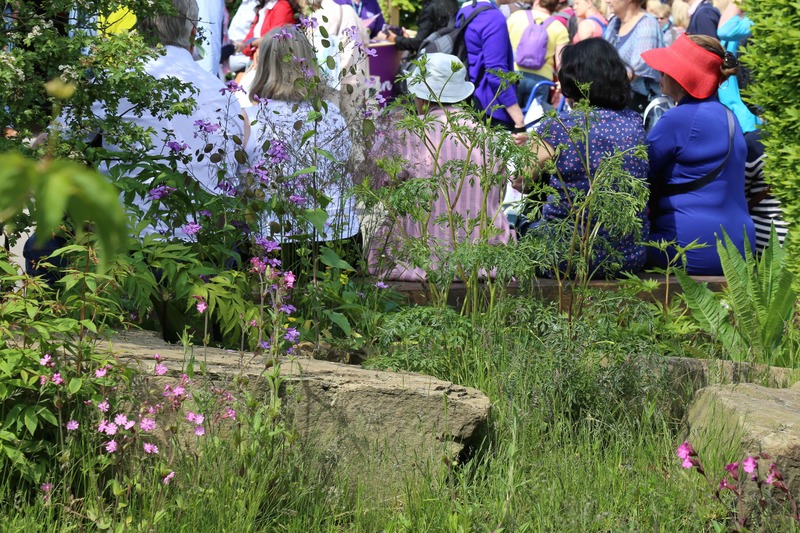 The Reachout garden was inspired by young people in Lancashire and depicts a girl leaning against a slate wall and the journey faced by young people on the way to adulthood. 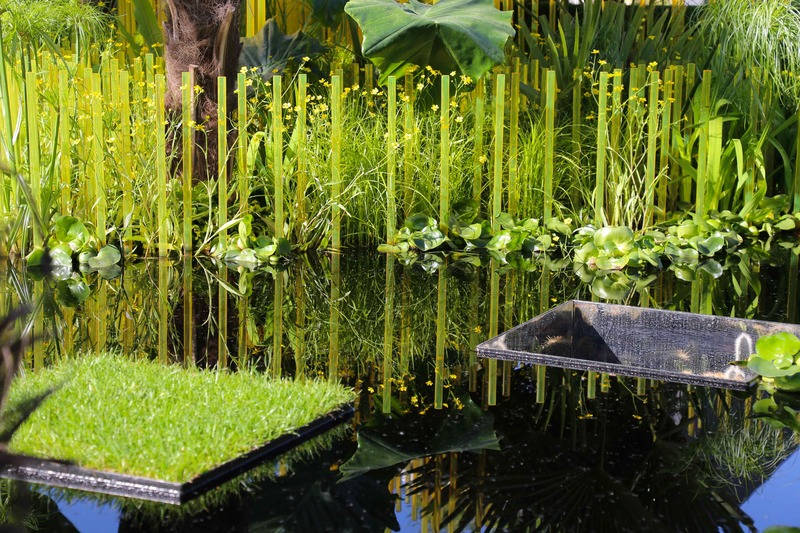 I really, really like these symbolic gardens with thought and purpose. 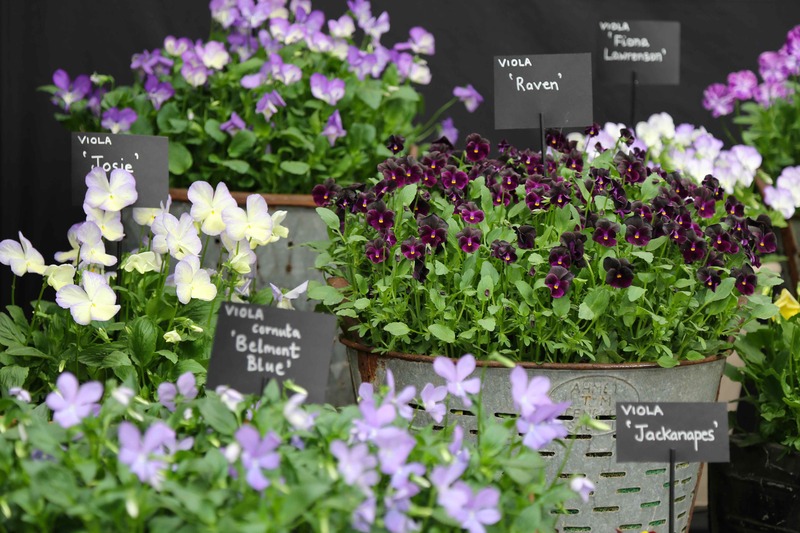 The great Pavillion hosts a brilliant selection of nurseries from the UK and across the world, amongst the displays the RHS Plant of the Year 2014 top 20. 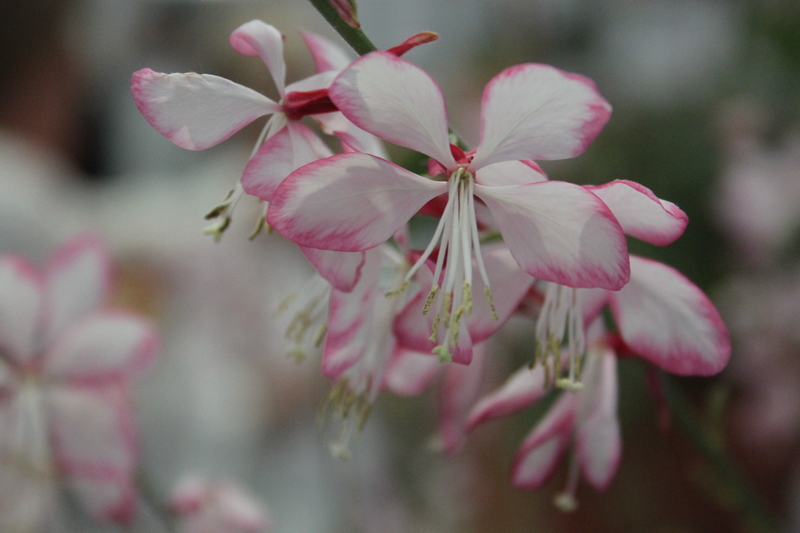 The Gaura did not win but would of been my choice. My husband a very keen cyclist, me less good, in fact rubbish at speedy cycling, but we both loved the Tour de Yorkshire garden. 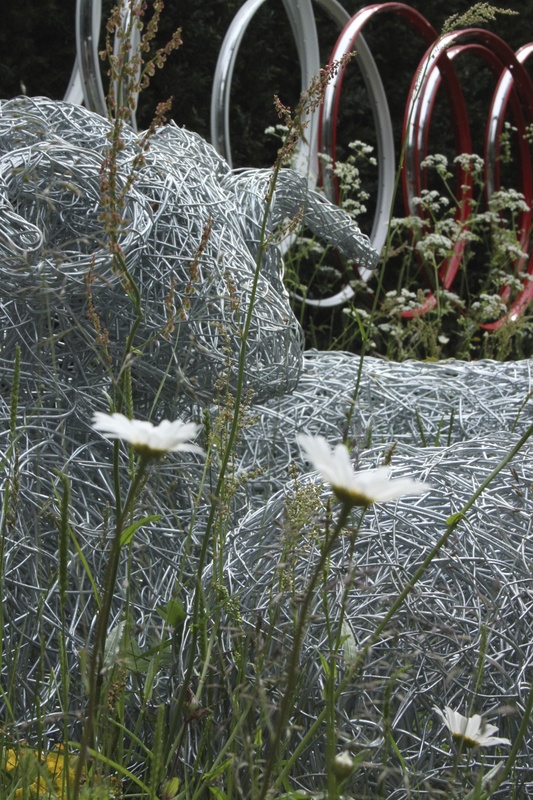 The tour de France is kicking off in Yorkshire this year, hence the link. 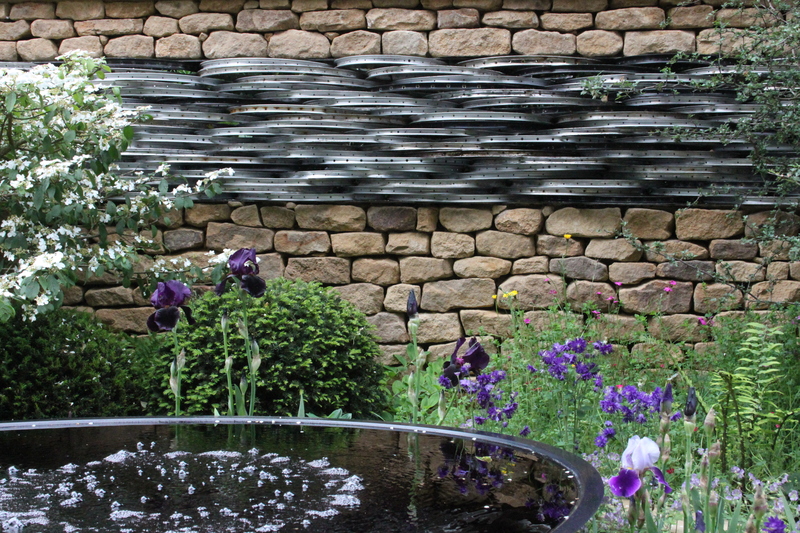 The beautiful York stone wall incorporated recycled bike wheels. The Best in Show Artisan garden Togenkyo (A Paradise on Earth) was beyond exceptional in its execution, the attention to detail staggeringly good. My only comment, someone had booked a rockabilly band to play in the adjoining food court area, the volume control knob was missing and a sound so out of context to this stunning garden ensued. I am very sure the designer Kazuyuki Ishihara did not like the music either. 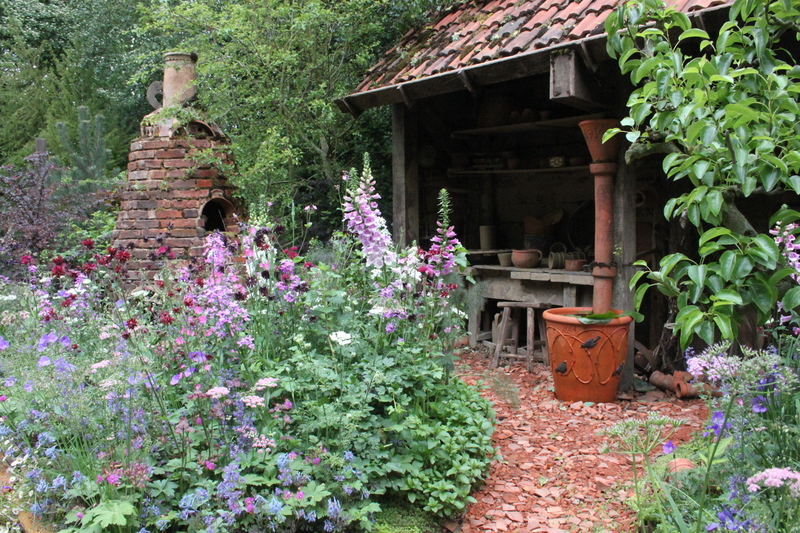 My favourite garden – the Potters garden, depicting a pottery, where the workers went off to the first world war and thankfully all survived, coming back to resume their work in the Pottery. 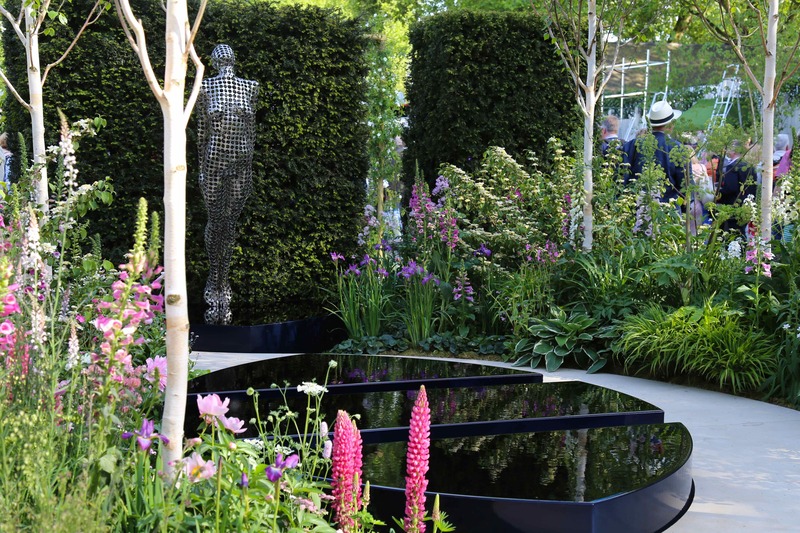 This was one of three gardens at Chelsea this year reflecting war. I understand Mr Titchmarsh now retired from presenting Chelsea came into a bit of flak for the safeness of his garden. It was jolly, I liked it. Bringing attention to the RHS Britain in Bloom initiative and isn’t that about being jolly, being inspired and bringing a bit of cheer to some of our dingier landscapes. The Show gardens, 15 this year, including one, the Cape Cod garden, which I could not find at all. A free map would be handy thrown in with the very pricey ticket. Can anyone identify this for me, on the very beautiful Laurent Perrier Garden, but missing from the plant list. P.S. 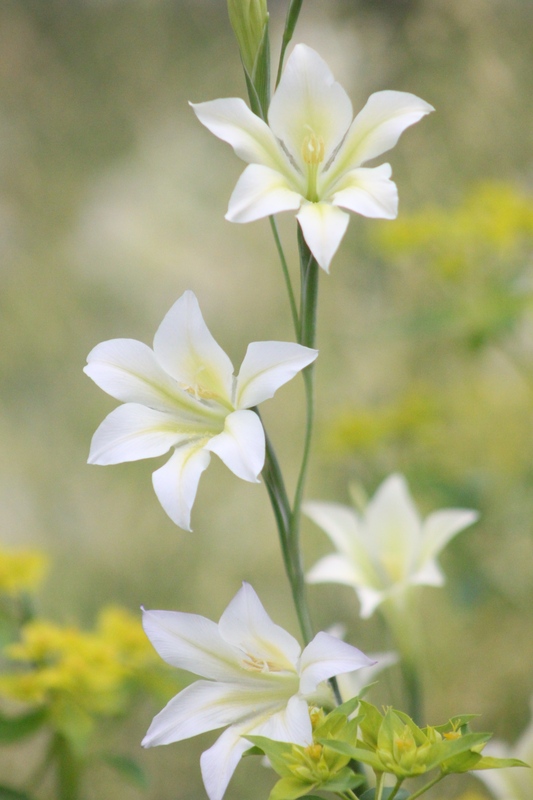 This afternoon (28.5.14) Neil from Avon Bulbs contacted me and identified this really beautiful plant for me, he could because they grew these for the Laurent Perrier garden, its Gladiolus tristis and available to order. 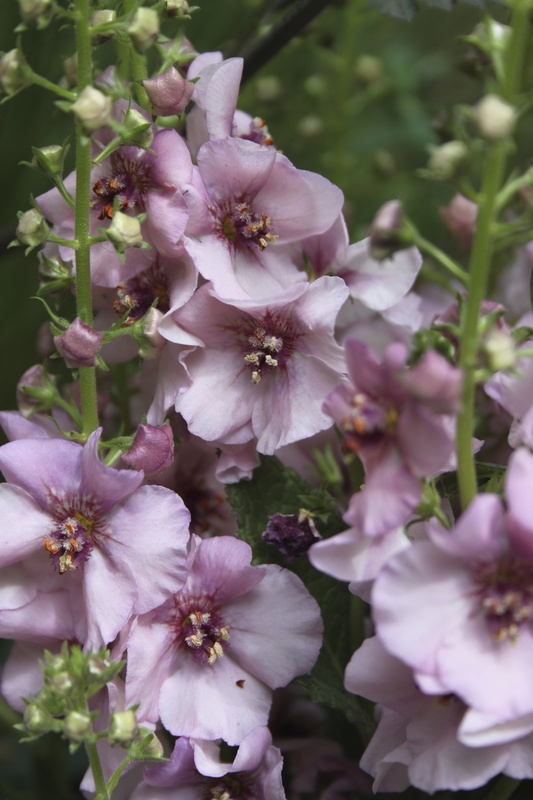 I had not appreciated that its also wonderfully scented in the evenings. 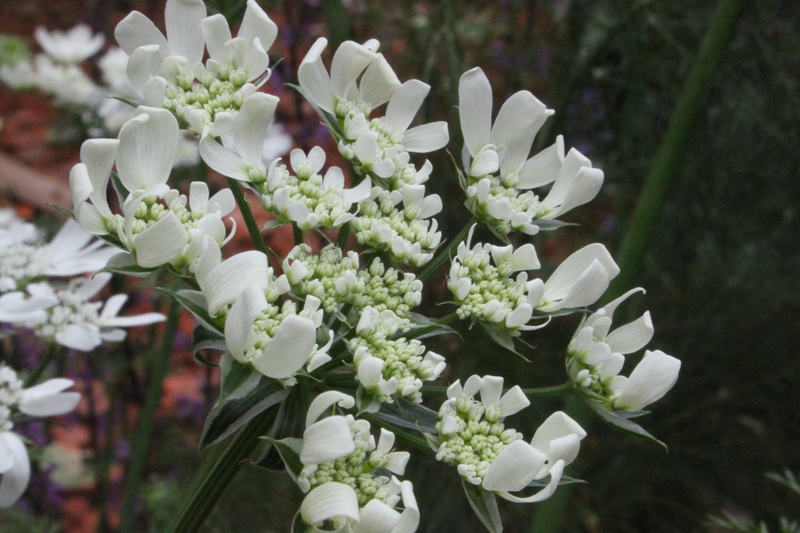 I loved the planting on the laurent Perrier garden, I have tried to grow Lupins and the wonderfully scented Phlox divaricata, both need more shelter than I can offer, I am growing the hardy annual Orlaya grandiflora for the first time this year, with seed I bought at Chelsea last year from Hardys. I have high hopes. Our afternoon ticket only gave us 4.5 hours, not enough time to visit the greatest flower show on earth. And now no more time to blog, I have potting up to do. 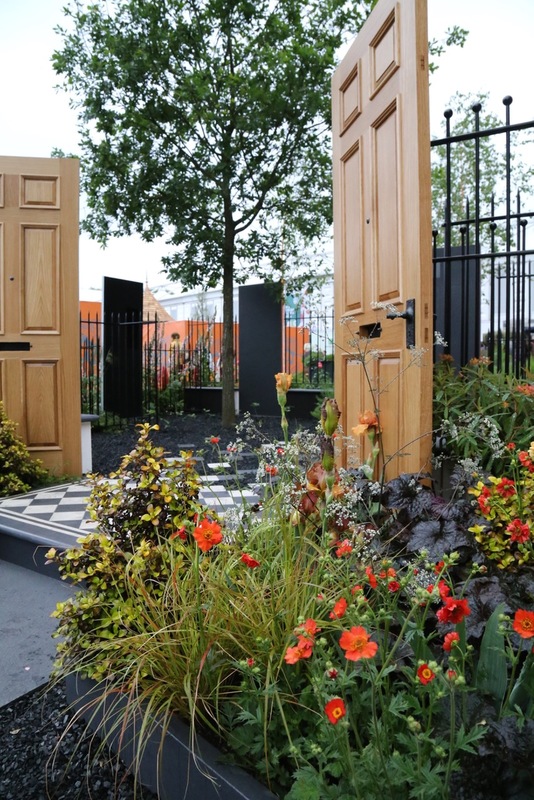 One last thought, I miss Diarmuid Gavin and his crazy outrageous but above all memorable gardens, there were many large very tasteful show gardens this year that in looking through 500 odd photos I can’t assign to any particular one with ease. A visit to Chelsea this year fell on a very cold Thursday, where the forecast was heavy rain at one, so we left home quite early and were through the gates by 9.00a.m. The grounds were already filled with people and getting anywhere near a main show garden took a bit of patience. In the nicest possible way, the first few gardens although beautiful would be perfect in the grounds of an upmarket hotel. 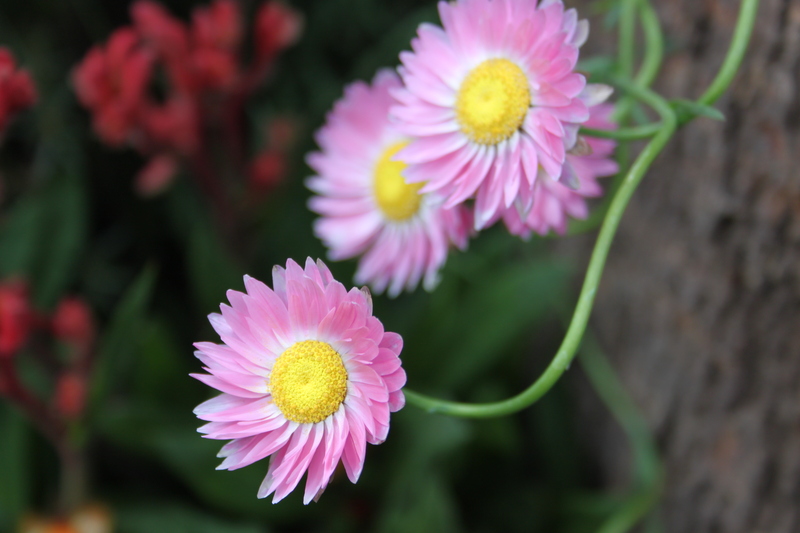 But its personal and appreciating plants and gardens is about how they reach out and touch a part of your soul. 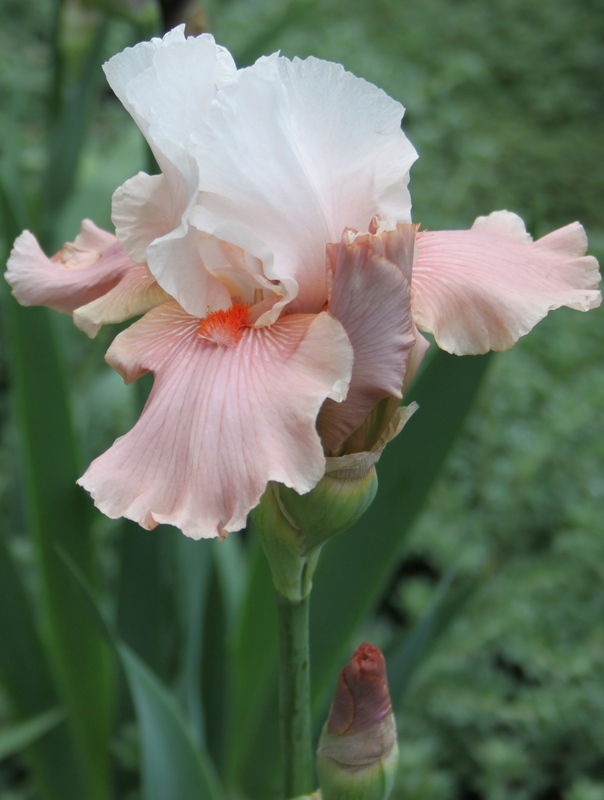 The beautiful Iris ‘Sugar Magnolia’ planted on Ulf Nordfjell’s Laurent-Perrier garden, available from Crocus. 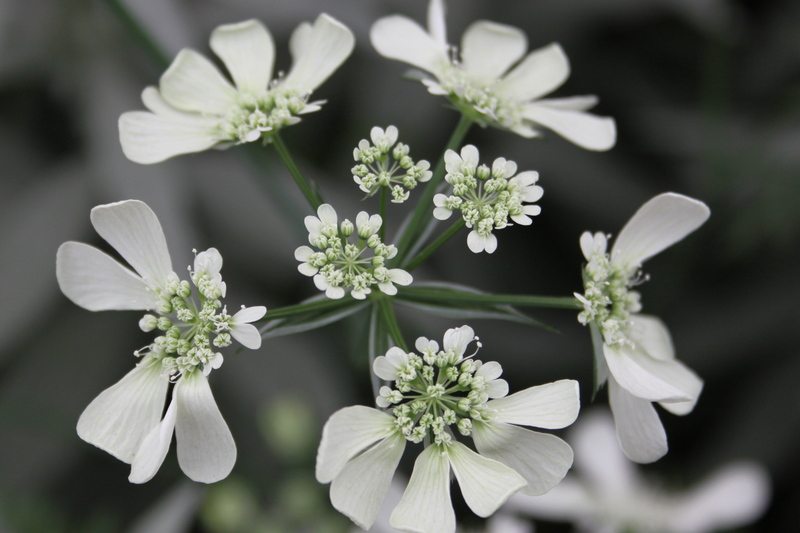 The Orlaya grandiflora on Prince Harry’s garden was my “I want that” plant of the day. 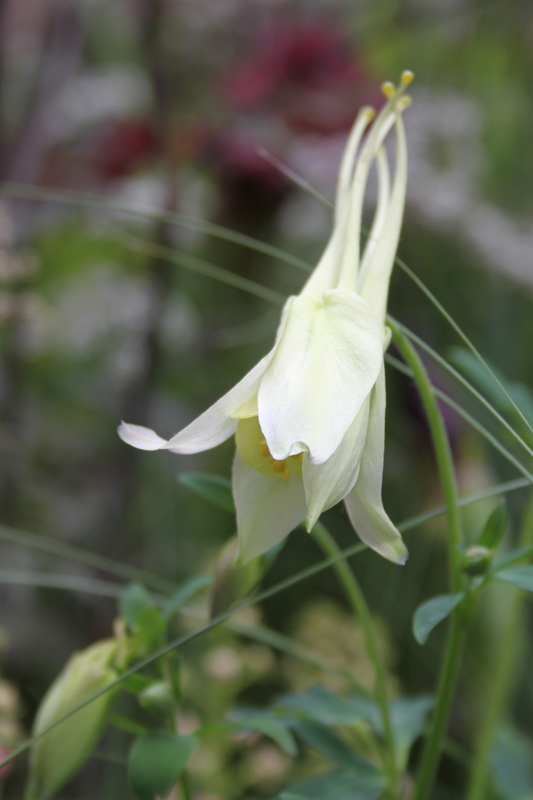 Later I was thrilled to find the seed available on Hardy Plants gold medal stand inside the marquee. Then the Homebase garden, ‘Sowing the Seed of Change’ yes this is for everybody, a lovely mix of edibles and affordable planting stylishly put together and designed by Adam Frost. We headed to Flemings Australian garden and absolutely loved the planting and concept, brilliantly designed by Phillip Johnson. Last year, in the same space was Diarmuid Gavin’s seven storey high sustainable garden and beside that the Korean garden and my favourite, Chris Beardshaw’s ‘The Furzey Garden’. The Australian garden, was on its own this year, replacing last years three gardens (is this corner for the non conventional?) apparently a little controversial that it took best in show, but to our untrained eyes, it was head and shoulders the main show garden winner. 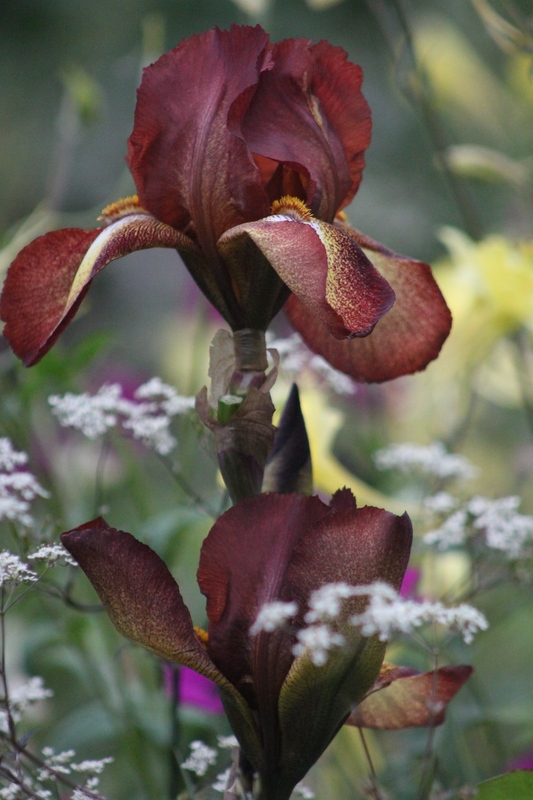 We queued to view and joyfully shuffled at a snails pace along the roped off garden. 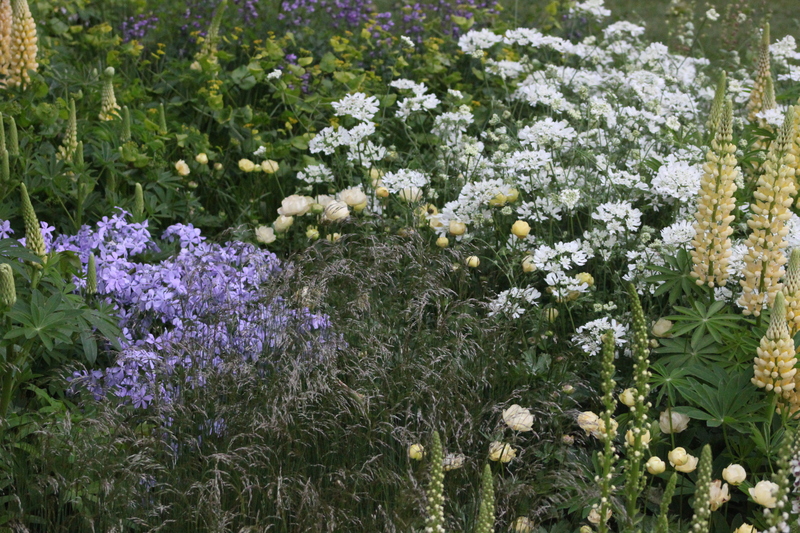 Expecting to see burnt browns and oranges, the garden was filled with lush greens, pinks, reds, mauves, greys, silver and gorgeous use of yellow and not one lovely delicate Cow Parsley relative in sight. This was a garden that made me engage and want to find out more not just about the plants but the country they originally grew in too. That could not be said of any of the other main show gardens this year. 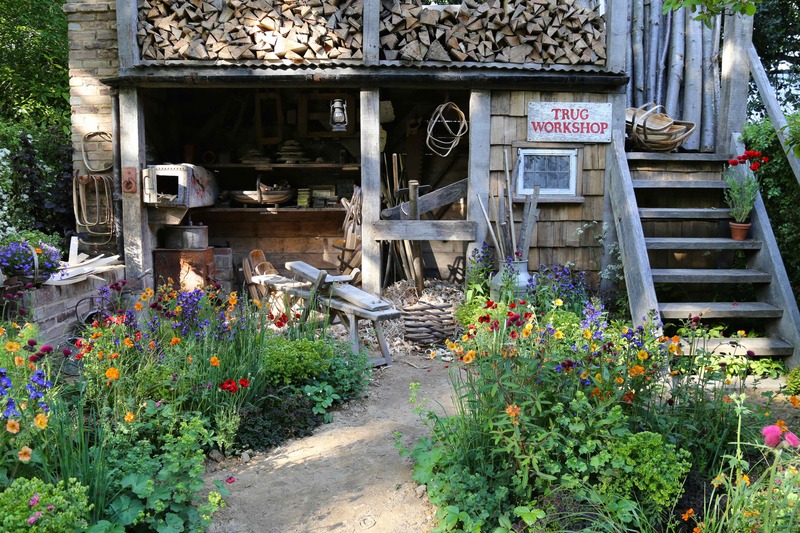 I think this is what I want more than anything from a show garden – a show. I want to be drawn in to find out more – Chelsea is a pricey ticket, when I get there, having arrived on a crowded train and the jostle is so dense I cannot stand back on my own to admire a garden, I want to be entertained and excited and absolutely most of all educated by something new. On to the Artisan gardens, all of them beautiful in their individual way, 8 gardens all different and hard to choose a favourite. Each entertained, engaged and educated me, leaving me wanting to explore and find out more about the different countries and regions or causes they represented. 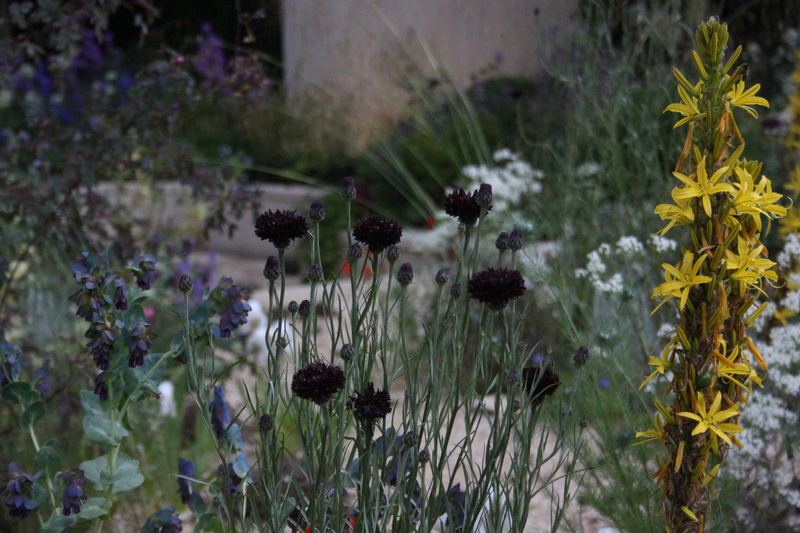 The very high standard of concept, design and planting of these tiny gardens, made viewing each one an absolute delight. 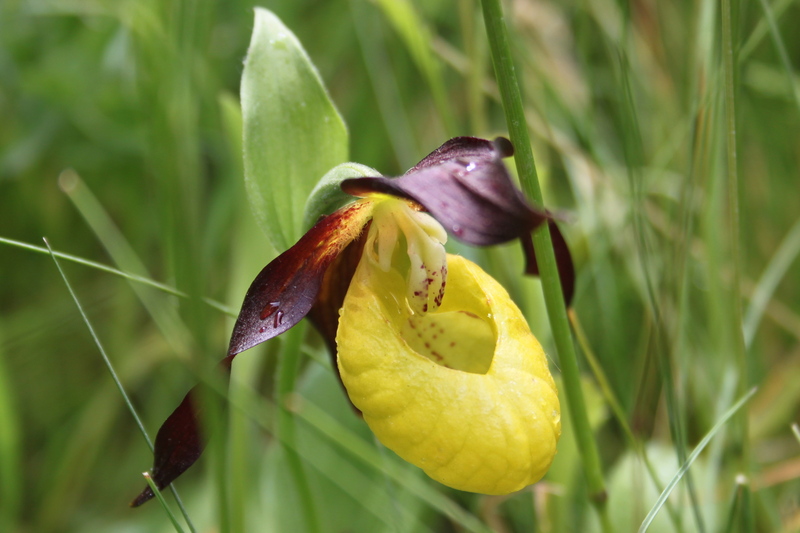 Planting on the Yorkshire garden, included a rare Lady’s Slipper Orchid. 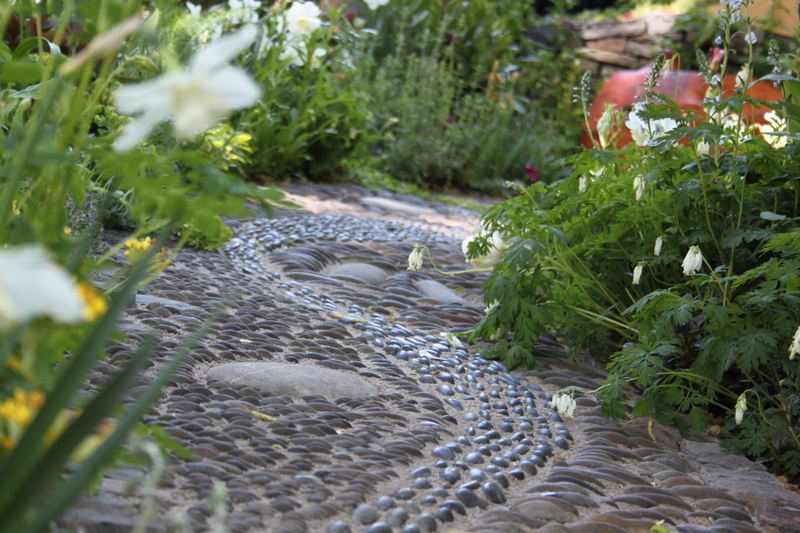 Inspired by the footpath in the The National Botanic Gardens of Wales ‘Get Well Soon’ garden, designed to be walked on barefoot, stimulating reflexology pressure points. 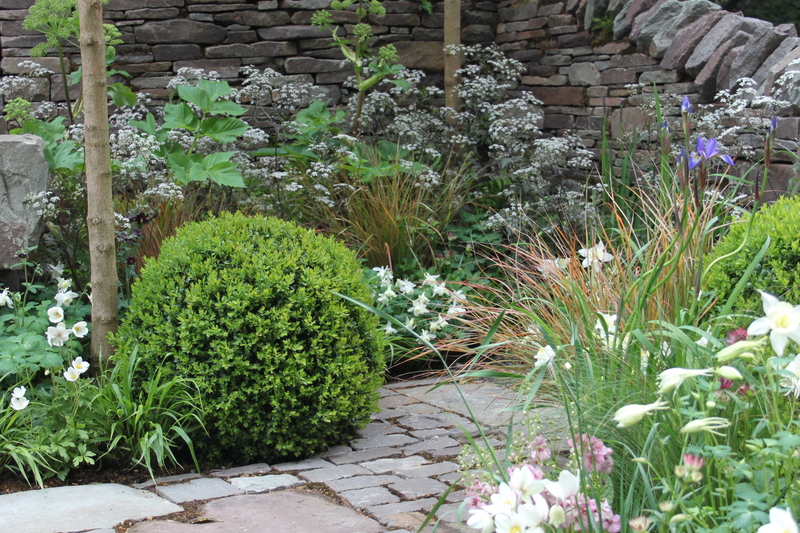 and Un Garreg, One Stone, inspired by the Breacon Beacons, had the most beautiful planting, both peaceful and moving. Then off to the Grand Marquee and finally the Fresh Gardens, I am not sure why the division in allocated space between Fresh and Artisan, as amongst the trade stands the Fresh gardens felt slightly second class, within the show layout. Shouldn’t new ideas be embraced more warmly? Then with an hour left before our train home, we revisited the Artisan gardens, and the main shopping avenue with Franchi’s Seeds still crowded with delighted customers. We really enjoyed our day and left in admiration of those who put a show on in the face of some really challenging 2013 English Spring weather. Chelsea is not for everybody, but horticulture is diverse, thankfully. 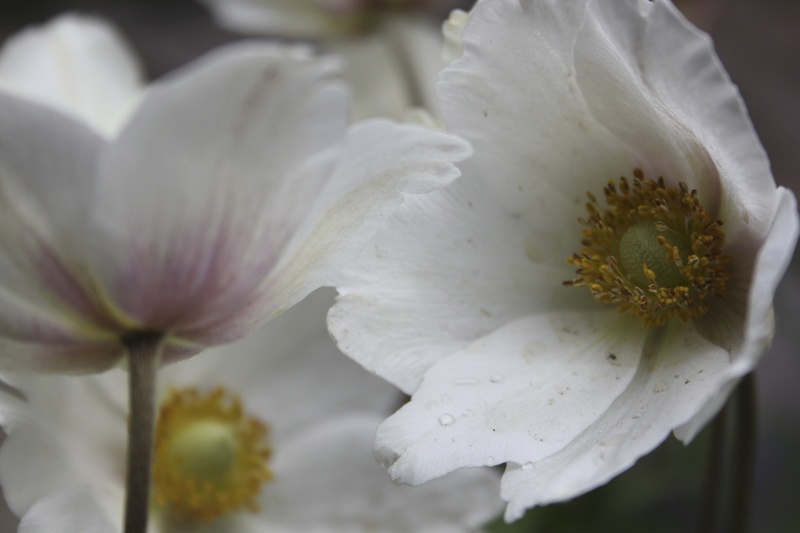 At a time when funds are being raised by the RHS to encourage the young into a gardening life, here at least are some of the aspirational plants, gardens and products, which showcase the diversity horticulture has to offer and hopefully be enticing enough to encourage younger gardeners to make horticulture a way of earning a living. I am a sporadic Chelsea visitor, sometimes preferring the space, freedom and elbow room of Hampton Court, sometimes neither and watch from the comfort of my home. 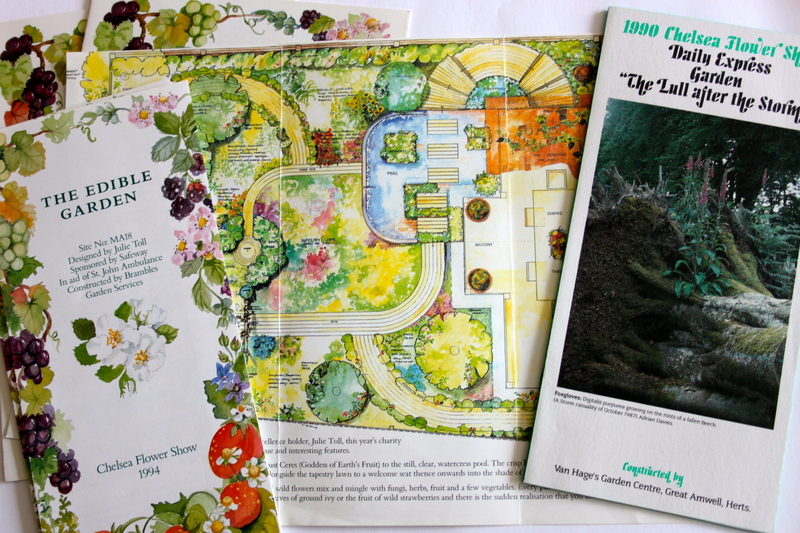 But every time I have visited I’ve kept the lovely leaflets from gardens that move or inspire me the most. 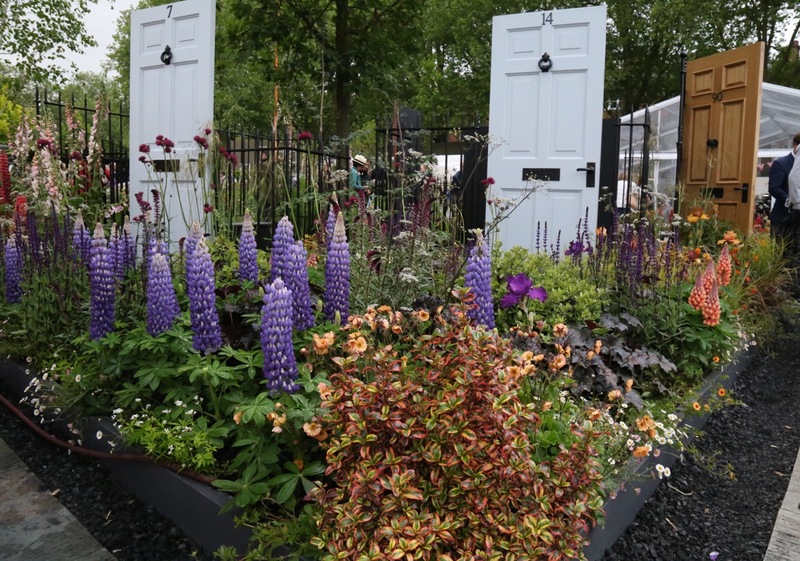 In my own tribute to the centenary year, I’ve tried to recall every show garden ever visited and two stand out for me, head and shoulders above the rest, but for different reasons. The Daily Express’ ‘The Lull after the Storm’ Chelsea 1990 and Julie Toll’s ‘The Edible Garden’ Chelsea 1994. “The Lull after the Storm” from the 1990 Chelsea Flower show, was magical, I kept running (early in the day) or politely attempting to get through the crowds to re visit. 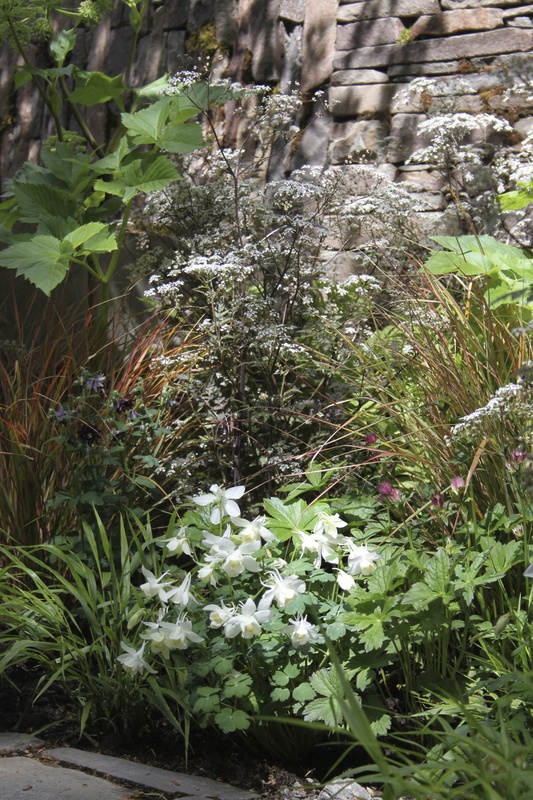 Inspired by The Great Storm of 1988, Jane Cordingley had been placed 1st in the Daily Express garden design competition. 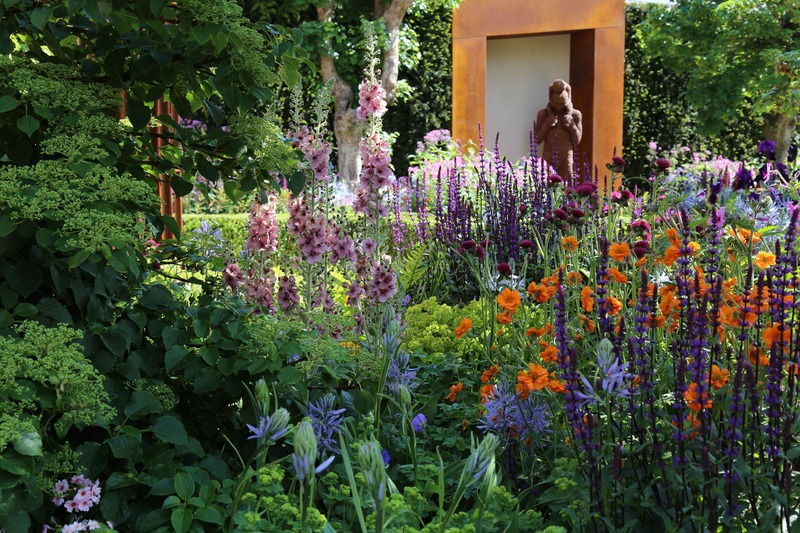 Based on her design, with contributions from the second and third placed entries, Van Hage constructed and planted. The garden was a gem of natural planting amidst the fallen trees. 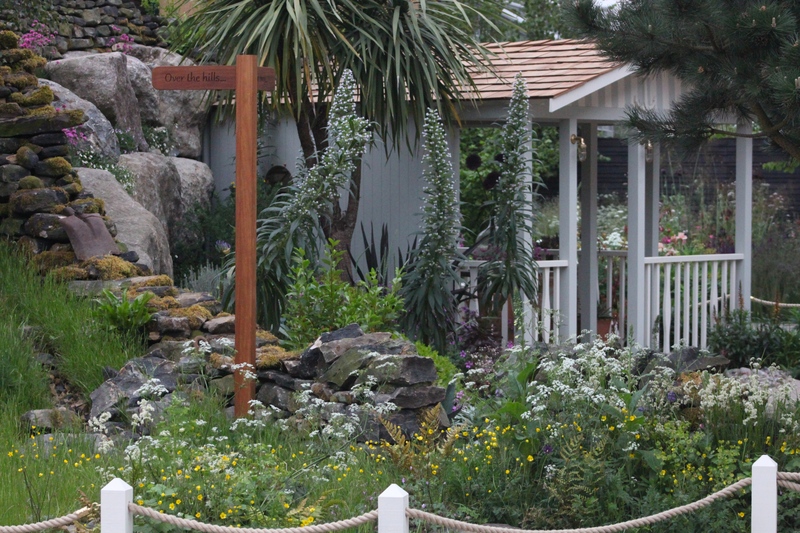 I hadn’t seen a show garden like this before, it was quite moving to view from my allotted shuffling spot. Long grass and wildflowers, ferns and a boggy area, a large pond, log paths, all woven around trees that had fallen in the great storm. My overriding memory is the long grass, and thinking yes! This is what a garden should be, free and wild. Not constrained and uptight. 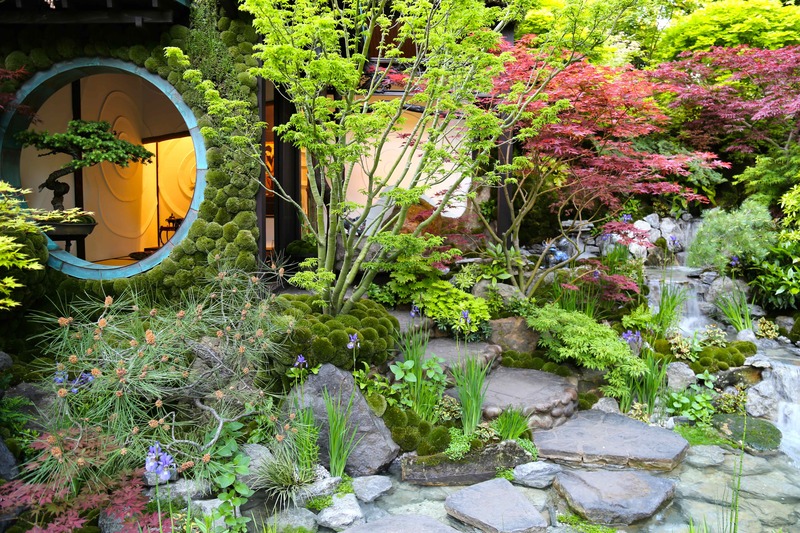 Back in 1990, there really did not seem to be anything like this gorgeous and regenerating natural garden. 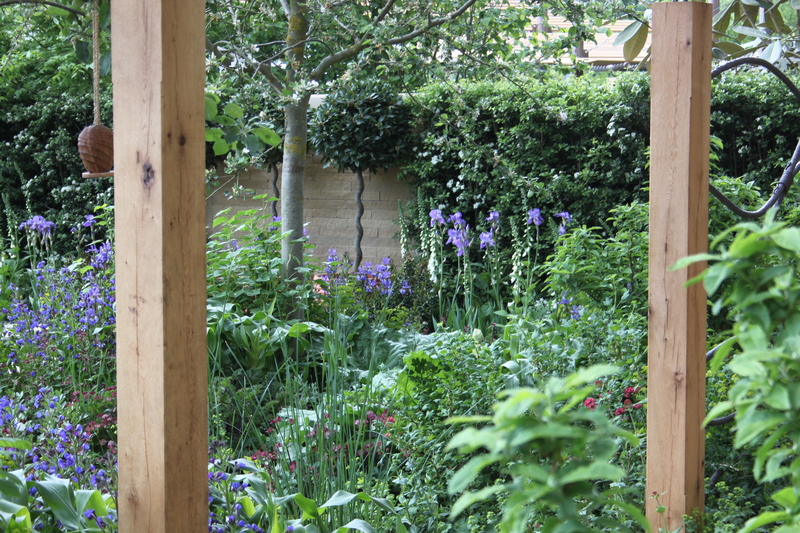 Four years later, I came across my other all time favourite garden; as a new mum of two children under two we had taken on an allotment, about a miles drive away. It was disastrous. Very young children want freedom and attention at the same time, not an absent-minded earth mother trying to sow, hoe, weed, dig, water, look jolly. We gave it up the day my youngest marched over to our car and bashed the bonnet with a metal children’s rake lovingly bought so that she could join in the allotment fun, clearly she wanted some of her parents time. So welcome was the sight of Julie Toll’s ‘The Edible Garden’, in aid of St John’s Ambulance, we viewed and viewed, at each end of the moving shuffle we went back to the beginning again, making lots of notes of what we could take from Julie’s ideas. 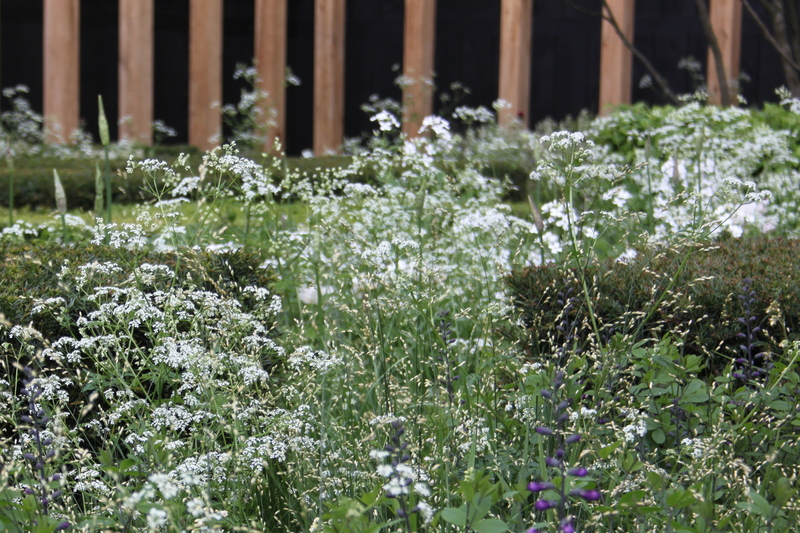 It was so inspiring and exactly what I wanted from any garden I have ever owned or would go on to own in the future. 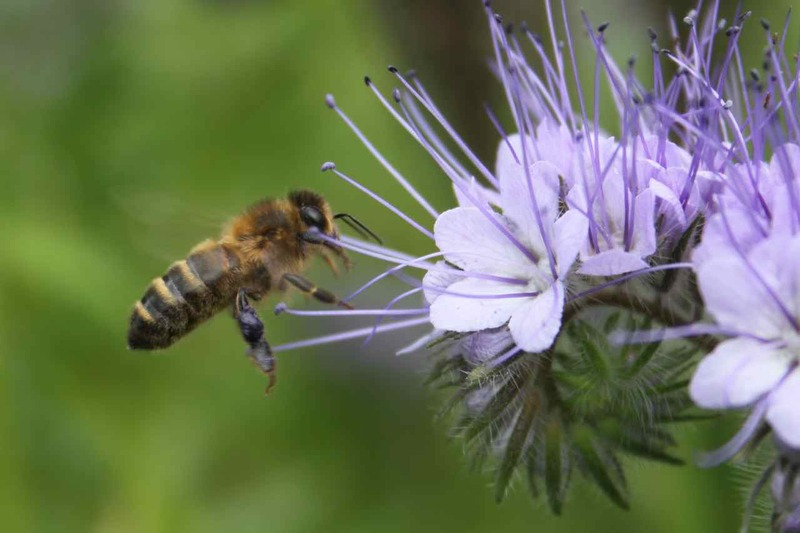 Borders were beautifully filled with wildflowers, herbs and fruits of all kinds, vegetables, native trees, shrubs and flowers. Brick scooterable paths linked each area and the centre a tapestry lawn, perfect for children to roll about in and collect daisies. A wonderfully planned and designed garden that could be translated and achieved by many and was the perfect solution for my young family. If the Peoples Garden award had existed then this would have been the absolute outright winner.